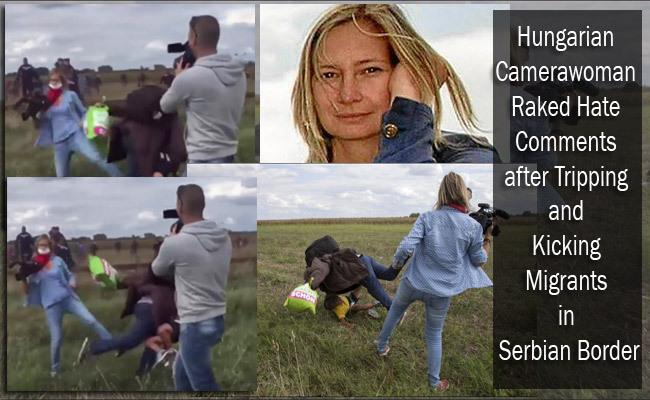 The Hungarian camerawoman identified as Petra Laszlo not only faces the rage of netizens all over the world, but lost her job after the footage of her kicking and tripping refugees went viral. Her footages were posted in a Facebook page called ‘Wall of Shame’ where commentaries were also posted about her actions that made netizens outpour their comments in outrage. By Wednesday afternoon, more than 15,000 likes on the posts were raked, showing hate on what she did. In the video, hundreds of migrants were kept in line by the police in the Serbian border, however, some of them had braved to break out of the line and run in the open fields. The police tried to catch them immediately. It was at this moment that Laszlo was caught on tape by the other journalists kicking two minors as they run near her. On another footage, Laszlo was seen tripping a father carrying his child as he ran passed her. She was filming the scene with her camera when the man ran right in front of her. She was quick to stick out her leg and trip the man. The father helplessly fell on his child. Read: Syrians faced death while crossing boundaries. Angelina Jolie visit to extend help. Amidst the calls against her action, Laszlo was fired from her job in N1TV. N1TV is an online based TV station. The company posted its statement saying that her action was a behavior in an unacceptable way and she was immediately fired. Due to her actions, two Hungarian opposition groups filed their criminal case complaints against Laszlo, but it is not yet clear of the police will pursue the said cases. Despite the outpour of comments of hate from people all over the globe, Laszlo had not broken her silence. Many had called her action disgraceful and not a good example as being a part of news media.